Medaram Jatara 2016 date, Medaram Jatara in 2016, sammakka sarakka jatara, When is Sammakka Sarakka Jatara 2016?, sammakka saralamma jatara, sammakka sarakka jatara 2016, sammakka sarakka jatara dates, When is Medaram Jatara 2016? Sammakka Saralamma Jatara 2016 dates are February 17, 18, 19 and 20. Sammakka Sarakka Jatara is observed in Magh month or Masam according to the Hindu calendar. According to the regular calendar it occurs in February. This is a biannual (Occurs at every two years) festival and attracts millions of people and is the largest tribal festival in the world. Sammakka Sarakka Jatara is also known as Sammakka Saralamma Jatara and Medaram Jatara. Medaram Jatara will start from Magha purnima and it occurs once in two years. Medaram Jatara is a tribal festival of honoring the goddesses celebrated in the Warangal district, Telangana State, India. 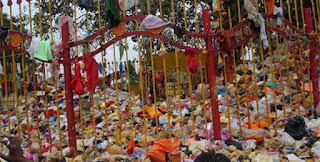 The first day of 17 Feb Saralamma or Sarakka goddess to be brought to gadde from Kannepalli. The second day Sammakka goddess to be brought to gadde from Chilakalammagutta. The third day Saralamma Sammakka placed on stage and lakhs of people attend Jatara on this day. the final and fourth day the idols of goddess will taken back into the forest. The story behind the Sammakka Sarakka Jatara is the Medaram ruled by the Pagididda Raju. His wife name is Sammakka and their children Saralamma, Nagulamma, Jampanna. People offer bangaram/gold (jaggery) of a quantity equal to their weight to the goddesses and take holy bath in Jampanna Vagu (stream). It is a festival with no vedic or brahmanic influence. Medaram Jatara is a State Festival of Telangana Governament. Medaram Jatara expecting largest people around the state. More than 10 million attended for the Sammaka Saralamma Jatara in the year of 2012 and 2014. In the year of 2016 Govt of Telangana released fund of 150 crores for arrangements. 3605 TSRTC buses from 51 regions will operated for Medaram Jatara across Telangana. The Buses will be available from 16 February to 21st February.